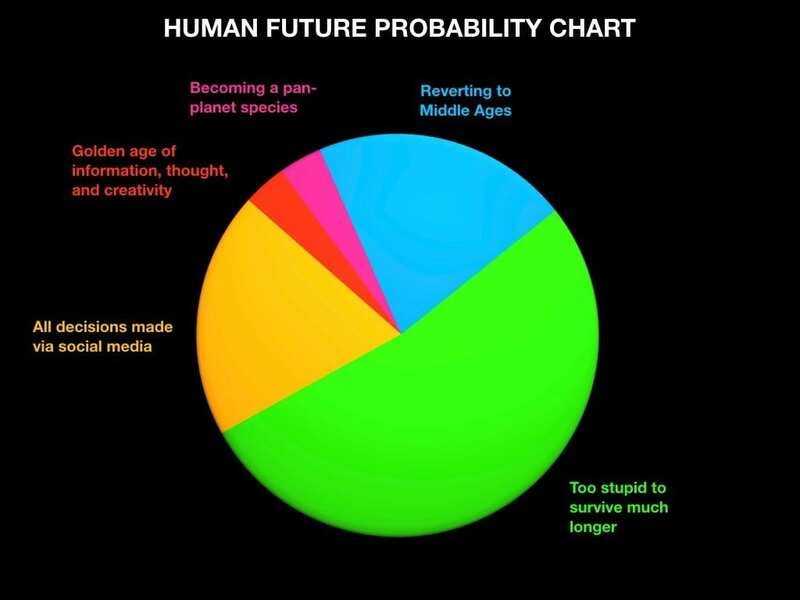 In my last post I referred to Psychohistory, Isaac Azimov’s fictional science which combines history, sociology and the mathematical statistics to make general predictions about the future behaviour of very large groups of people – in other words to explore alternative futures. It has been said that the World Wide Web is a portent of precisely such a thing which is why those who invented it created the interdisciplinary field of Web Science. Since its public release in to human society the Web has evolved from being a small academically orientated Read Only (push information out) information community to a global publishing Read-Write infrastructure upon which almost 50% of humans interact with each other facilitated by the largest companies of the modern era. The Web is changing the World, and the World is changing the Web (see 10th anniversary video). Not only do we communicate via the Web but increasingly it is becoming an environment where we actually live (Luciano Floridi) and as with all social ecosystems our ability to co-habit as a bunch of evolved apes is dependent on the rules and norms which govern how we act and treat each other. In previous eras the relative rates of technical and societal change have been roughly equivalent. In the digital age this is not the case, which is why we created Brave Conversations in 2017. Brave Conversations is the first non-academic but publicly focused Web Science event to provide people from all walks of life – industry, government, academia, and the community sectors – with the opportunity to sit back, reflect and respectfully explore the socio-technical issues beginning to arise as a result of digital information technologies. It carries on from MetaLounge, our first attempts from 2008 – 2011 to create these types of event, and has now had four iterations around the world; 2017 in Canberra; Dubai as part of the 2018 World Government Summit; London 2018 in partnership with SoapBox Islington, and Kingston, Jamaica in July 2018 hosted by the Jamaican Broadcasting Commission. At each event I have been humbled and privileged to help facilitate and encourage people to be truly brave in addressing issues which have been both confronting and uncomfortable, but most importantly to feel that at the end of each session they have left slightly more educate and enabled, but most of all empowered, to more proactively navigate and negotiate their digital lives. Throughout we have continually been asked “what is a ‘brave’ conversation“? As we were designing the programme it struck us that the most valuable thing we could contribute to the global dialogue would be to intentionally confront people with ideas, concepts and suggestions that they may intuitively be aware of but were unable to explore, understand or articulate in a public space. Our Canberra event taught us the importance of actively listening to, and integrating the voice of young people. It also demonstrated the benefit of having a diversity of voices in the room, sometimes creating discomfort and tension when language was a barrier, by which I mean those comfortable with technical language and those not. This is why we chose to partner with SoapBox Islington and a huge thanks to James Dellow, Nick Crivello and all the team there for their wonderful hospitality and terrific group of young people who joined us. Thank you also to Tris Lumley, Lydia Hascott and Jo Wolfe for their incredible support and amazing organisational skills in supporting Leanne Fry, Bel Campbell and me throughout. As we were framing Brave Conversations London we reflected on the 2018 Data breach scandals and the calls for ethics to be more proactively integrated in to the development of digital technologies. But which ‘ethics’? Ethics, from my understanding, is relative and is based on how you see the world, what matters and how things fit together. As we explored this we determined that what was more important was to help people focus on and articulate their values as a foundation piece in order to have brave conversations, particularly as the group was quite diverse having a good mix of sexes, around a third under the age of 35, together with a number in their 70s, and one family of three generations. Values are the basic beliefs that an individual thinks to be true. Every individual has a set of values through which he looks at all things and also at the world. Ethics are guidelines or rules that are set for a society or an organization rather than for an individual. Values can be said to be the guiding principles in one’s life. ‘Value’ can be defined as a bridge by which an individual makes a decision regarding good and bad, right or wrong, and most important or less important. Ethics can be defined as set of rules formulated by a country or a company or some institutions. Ethics is mainly based on the moral values. We crafted our values framework based on both an interpretation of Maslow’s Hierarchy of Needs combined with Moore and Khagran’s Strategic Triangle for Creating Public Value. Not only did we frame our questions around the questions of ‘what Can we do‘ (logos, the technology) and ‘what Should we do‘ (ethos, culture) but we also highlighted the need to ask ‘what May we do‘ (pathos, authority) – see illustration below. In addition we created a very simple, but quite informative, algorithm to poll the group about their feelings towards technology asking four questions to elicit their confidence that five potential technology innovations would improve their lives. This graphic shows the results - a score of -0.18, in other words they were not confident at all. Whilst the exercise was both crude and we did not have a lot of time to explain it in detail, it was indicative in terms of the general feeling in the room over the two days and the flavour of the discussions that were held. What we learned in London then informed how we framed the conversations for Jamaica. I met Cordel Green at the Harvard Kennedy School and our mutual interest in digital literacy and the need to empower people in the digital world resulted in his very kind invitation to travel to Kingston to hold Brave Conversations. Not only was I welcomed with open arms but I was almost overwhelmed by the hospitality I was given and a huge thanks to Cordel, Karlene Salmon, Don Dobson and all at Broadcom for giving me such a privileged insight in to Jamaica. Thank you also to Kemal Brown and his incredible team who recorded it all. Broadcom is the communications regulator in Jamaica, but not only is it doing that it is taking the lead in educating the Jamaican community about the world of information and both their rights and responsibilities in it. We kicked off with an interview on Smile Jamaica, the opening of the Jamaican Teachers’ Federation Conference, and a radio interview, all of which gave me some initial insights in to this wonderful country. Many of the conversations I heard in Jamaica were similar to those I hear elsewhere, but with their own unique twist. Jamaica’s history, geography, climate and demographics have created an island paradise from which individuals have always shone on the world stage and of course writers such as Ian Fleming have been at their creative best. Jamaica’s most pressing challenge is its crime rate. According to the World Economic Forum’s Global Competitiveness Report 2017-2018 the most problematic factors for doing business in the country are Crime and Theft, Taxes and Corruption. But this links to so many other factors, and what resonated deeply for me was the determination to help young people develop the resources and resilience through both education and opportunity to help change this and determine a different future. This was coupled by the high level of religious affiliation which was proudly displayed and acknowledged. When I was crafting Brave Conversations Jamaica I wondered what impact this would have particularly as one of the key thinkers we reference is Yuval Noah Harari, whose Homo Deus and interviews directly challenge traditional religions comparing them to the “playing of virtual reality games in order to give humans meaning and purpose”. It proved to be a core part of the conversations, and an opportunity to push both boundaries and ideas. We chose the word brave because any discussion around technology forces us as human beings to confront our deepest beliefs, aspirations and above all fears – how we see and make sense of the world and above all the things we are afraid of losing – from the basics of safety and security, to the intimacy of love. 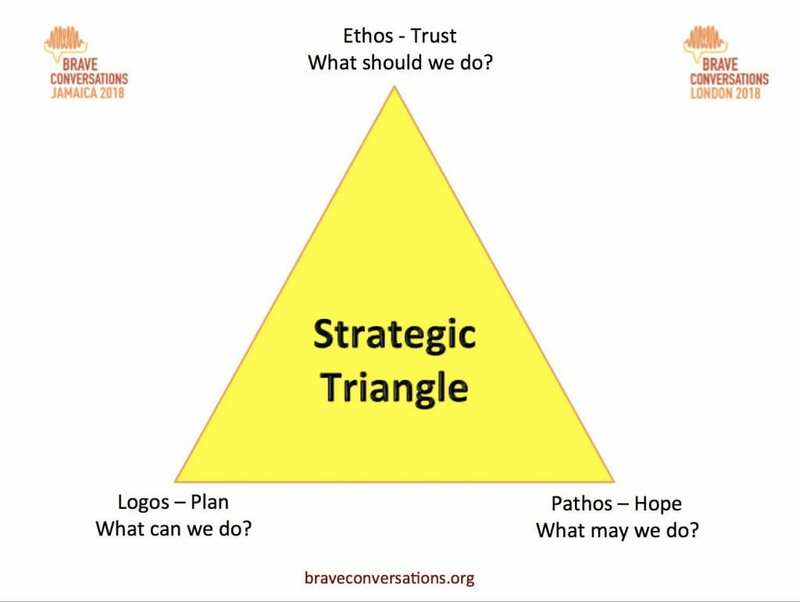 At each of our Brave Conversations a mini-community evolved within which there was a degree of discomfort, people did have to explore and listen to different, and often challenging, viewpoints, but there began to emanate both a sense of trust and the preparedness to be brave. Having now run Brave Conversations in numerous countries, and with other opportunities in the pipeline, we are keen to do whatever we can to help people better understand and appreciate the new digital space within which they are living. What I have learned is that if we can provide the framework, the information and safe space for people to take a risk, present themselves as truly curious and smart humans, they will be brave and they willingly embrace the opportunity. The real question of course is that armed with the insights of research, coupled with the power and communication afforded by our technologies, and with Humanity’s future at stake, can we afford not to be brave?